Is it possible to print a 3D object which is fully silver and looks like a sort of ring, or a cage ring? What is the minimal layer of PLA for electrical insulation between two metal layer ? (crossing two line) and what is the necessary width of PLA in two metal line on same layer? Do you have a measured resistance to horizontal and vertical metal print? What is the minimum reproduction size of the conductive paths the machine can lay down? What is the maximum size of the objects that can printed? Why is there a triangle shaped object that printed with my model on the build plate? There is a squeaking sound coming from my z-axis. What can I do? There is a squeak coming from the x and y-axis. What can I do? My silver traces exhibit what appear to be "hersery's kiss" attributes in some places. How can I address this? Why does the alignment process take so long? Should I wear gloves when handling the conductive silver ink? The alignment process seems stuck/frozen. What's going on? Why does the z-axis jog buttons in the Voxel8 Control Interface move the Build Plate in the opposite direction I expect? My nozzle is ripping the blue tape I have applied to the build plate surface. What is going on? My print quality is off. What should I do? My silver is not printing correctly? What should I do? My Voxel8 Printer is making a buzzing sound. What is that about and what can I do to fix it? What is the minimum clearance between two paths of conductive material to ensure there are no shorts? Is the Voxel8 Printer capable of printing geometries which require support material? How do I load/unload my thermoplastic filament in the Voxel8 Printer? I have large, flat 3D printed part that keeps warping in a corner. How do I keep the part from doing this? The thermoplastic filament is making a skipping sound when it's feeding into the extruder. How do I fix this? I am getting a filament stripping event with the FFF extruder. How can I address this? My print job stopped without manual user intervention, what is going on? What is the minimum layer height that can be printed in silver? What print job is "air printing", but not exhibiting skipping. What could be the issue? Do you offer support generation in your models? Do you offer brim and skirt generation? Do you support raft generation? Are there (environmental) conditions that can interfere with the laser profilometer to make it fail? What methods can I use to get (gcode) files onto the Developers' Kit printer? I am getting a "failed to detect trace" error message on the touchscreen during the alignment procedure. How do I troubleshoot this? During alignment, I am receiving a an error dialog on the touchscreen that reads: "invalid literal for int() with base 10: 'Cartridge Inserted\nok 24571". What could be the issue? During alignment, I am receiving a an error dialog on the touchscreen that reads: "invalid literal for int() with base 10". What could be the issue? During alignment, I am receiving a an error dialog on the touchscreen that reads: "Failure: Align Nozzles - Failed to get a reading from the laser error". What could be the issue? During alignment, I am receiving a an error dialog on the touchscreen that reads: "Failed to correct good silver printing height". What could be the issue? During alignment, I am receiving a an error dialog on the touchscreen that reads: "invalid literal for int() with base 10: 'Cartridge Inserted\nFFF Cartridge Removed\nCartridge Removed. Print cancelled, heating disabled\n// action:cancel\nok 24571"
During alignment, I am receiving a strange error that reads: "Failure: Align Nozzles, unsupported operand type(s) for -:'NoneType' and 'int'". What does this mean? Silver has stopped dispensing and I am noticing a yellow/orange piece of material on the end of the red nozzle dispense tip. Why is this? Silver has stopped dispensing on the machine. There is a brand new tip installed, silver inside the syringe, and there is pressure coming to the printhead when temporarily removing the loaded silver syringe, and attempting to "dry print" with silver. What could be the issue? The Voxel8 Developer's Kit printer is making a sharp repeating clicking noise from the lower back right area of the printer. What is that? How can I make it stop? The build plate is not heating on a print job. What could be the problem? Yes, as long as the silver is supported by thermoplastic. Printing silver without the plastic makes it very difficult to remove from the printer and is not recommended, even in the xy plane. What is the minimal layer of PLA for electrical insulation between two printed traces ? (crossing two traces) and what is the necessary width of PLA in two printed traces the on same layer? We recommend leaving one layer of open air head room (0.19 mm) then a layer of PLA over the top of it (0.19 mm). Resistance is lower per length in Z-traces. 0.8 mm, but placing components becomes more challenging depending on your design. What is the maximum size of the objects that can be printed? The build volume of printer is currently 15 cm (x-axis) x 15 cm (y-axis) x 10 cm (z-axis). However, it is possible to design larger parts and then assemble them in a modular fashion with a proper design beforehand. This is technically called the "wiping" tower. It is used during the printing process to make sure silver is dispensing, and that any unwanted thermoplastic is deposited not on your print, but rather the tower structure. The best thing to do is contact support. However, sometimes this issue can be caused by not enough lubrication. We recommend putting a small amount of synthetic grease on the z-axis rod to see if that fixes it, first. The best thing to do is contact support. However, sometimes this issue can be caused by not enough lubrication. We recommend putting a small amount of oil on the x and/or y axis to properly ensure it is coated for operation. Use a silver ramp factor of 0.25 to reduce the "hershey's kiss" behavior. The built in laser distance sensor is carefully scanning the build plate area and during that time the alignment is carefully calibrated down to micron level accuracy. Yes. We recommend you wear gloves when working with the silver. You should consult the SDS and also visit the "Working with Silver" article. During the silver alignment process the laser distance sensor is making very calculated readings in several locations around the build plate which are very difficult to notice by the eye. If you open the Voxel8 Control Interface "terminal" tab during the alignment process you can see commands that are getting executed during this process. The up and down arrows refer to the extruder heads and not the build plate. So, essentially even though the extruder heads are not moving, you should think of z-axis movement of the extruder head moving up and down, and not the build plate. This is just how OctoPrint works which is what the Voxel8 Control Interface is built on top of. Your nozzle height is likely miscalibrated and too close to the build plate. This is a sign that you are printing "too low". You need to re-run the bed alignment procedure and move the nozzle up in very small increments. Refer to our Troubleshooting guide, first. This is normal operation. Pnemuatic pump pressure has not been attained and the chamber is filling with pressurized air. We are currently doing some tests. We will post final results when we have them. An estimate is about 0.8mm right now. Yes. We can print support material which is composed of the same thermoplastic dispensed by the left print head (i.e. we currently do not support dissolvable support material in the second printer head). Check out this article on how to properly load and unload your thermoplastic filament. It depends on whether your build plate is heated and what material you are using. In the case of ABS and heated build plate, you may want to use some gluestick on the blue painter's tape applied to the plate. In the case of PLA, you should check the melt temperature of the material. You can try adding a brim, or a custom raft to give the part more surface adhesion. We also recommend try printing with the hood down to minimize thermal variance. The thermoplastic filament is making a clicking sound when it's feeding into the extruder. How do I fix this? Reseat filament by removing the filament and reinserting it. Make sure filament is free spinning from top of extruder to filament spool bay. Check out the skipping article if it persists and follow the instructions there. You will want to consult the stripping and skipping article on how to troubleshoot this issue. How do I make the pneumatic rattle noise stop on the printer? You relieve pressure from the pneumatic tank by accessing settings in the front panel touchscreen, and printing a silver trace. Do you have embedded components inside your print? The printer may be pausing for component placement. Have you checked materials to make sure they are still loaded? A print head cartridge may have also come loose, so check those to make sure they are seated properly. 190 micron is the default. However, by adjusting the air pressure it is possible to dispense less ink with the 250 micron diameter nozzle. We recommend experimenting if that is your use case. What print job is "air printing" (i.e. xyz movements but no material dispensed), but not exhibiting skipping. What could be the issue? It could be a case of stripping, you should consult this troubleshooting page. Yes. It is a selection in Dashboard before slicing a model. Yes. It is a feature in Dashboard before slicing a model. No we do not. If you want to do a raft you can generate that as part of your model for printing. Yes. Any physical object in between the laser and the build plate. Errors can also be caused by direct sunlight which may interfere with the sensor's ability to accurately get the laser. What methods can I use to get (gcode) files onto the Developer's Kit printer? Normally you send gcode files over an internet connection from Dashboard. However, it is possible to upload sliced gcode files directly into the printer via the Voxel8 control interface. We support physical cable connectivity as well as wireless. We do not support USB or SD card side loading. a.) your red tip silver dispense nozzle is clogged (and needs to be replaced). b.) the red tip nozzle is bent or otherwise damaged and needs replacement. causing silver to not extrude. c.) You have not recently applied Voxel8 wiping solvent to your silver print head sponges and it is causing a clog (see a). d.) You ran out of silver. Check the silver syringe and make sure silver is present in it and not empty or running very low. e.) It is possible that your silver in the syringe has cured over a long period of time if you did not apply the blue caps to both ends of the material after removing it from the machine. Consult the silver handling & care page. Please review our silver handling and troubleshooting sections for more information about proper maintenance and care of the Voxel8 silver and the printer. If you continue to have issues, please submit a request for us to help. This is a legacy error which means that one of your print head cartridges may be loose or unseated from the carriage holder. This can happen if a print head nozzle inadvertantly strikes the build plate for instance. First you should try removing and then inserting each print head (i.e. silver extruder and thermoplastic extruder) back into the machine, and seeing if error persists. This error message can occur if you attempt to do an operation too closely to the alignment procedure (e.g. home xyz and then clicking start alignment). The fix is to wait for the machine to respond between operations at this point in time. This most likely means that the laser profilometer on the machine has either become unseated from its connection, or is out of range of a laser scan. This is very rare error. If you experience it, please re-run alignment and see if you can replicate the condition. If it continues, you'll want to contact support so that we can further troubleshoot the issue. This means that the Developer's Kit Printer laser scan during alignment failed to find enough silver on the build plate after it was dispensed. This is usually due to insufficient silver material loaded in the syringe, a damaged or clogged nozzle, or possibly very low silver pressure. Check out the silver calibration article, silver handling article, and troubleshooting page. This means one or more print heads on the machine are not fully seated inside their respective cartridge holders. You should remove and reseat both the plastic FFF cartridge and silver cartridge to see if the problem is resolved. This is an indication that you may be running older firmware which does not have more detailed error messages. 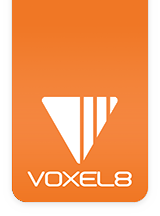 You should read more about how the firmware updates work on the Voxel8 Developer's Kit printer, and make sure that your machine has the latest firmware installed. Silver has stopped extruding and I am noticing a yellow/orange piece of material on the end of the red nozzle dispense tip. Why is this? This could be due to wiping station sponge material that is clogged in the red dispense nozzle. You should replace the tip if this is the case. If it is possible to pause the print job and remove the sponge material from the nozzle without damaging it, then that is also something to try. This is usually a hardware issue if there is a brand new red dispense tip on the machine. There are two common reasons for this: a lower level leak in the pneumatics system (which requires contacting support), or the solenoid has been accidentally unplugged. For the second possibility, this requires first removing the silver print head. Secondly, removing the silver print head cover, and lastly searching for the black and red wires that may be unseated from the connector on the PCB of the print head inside the cartridge sleeve. This clicking noise is most probably the regulator that is part of the pneumatic system. This normally means that pressure cannot be attained. One of the first potential causes for this is an incorrectly inserted hose. You should check all the pneumatic hoses to make sure they are plugged in and pressure is maintained. A second reason might be trying to print silver without the silver properly loaded. You should verify that your silver has been loaded according to online instructions. Another potential problem might be a faulty pneumatic sled. This third problem requires a replacement pneumatic sled. However, you should contact support to troubleshoot your pneumatic sled to figure out what the root cause is. The most common explanation is that the build plate is not installed correctly. The first thing to do is check to make sure it is flat and well seated by gently trying to wiggle it while inserted into the magnetic mounts. Follow the instructions carefully from the initial setup. If the temperature reading on the touchscreen is still "N/A", then it is recommended to open up the Voxel8 Control Interface (i.e. octoprint), and take a look for any errors in "Machine State". Also try setting the build plate temperature under "Tool temperature" and with build plate set to some arbitrary temperature. In terms of hardware, it is possible that the pogo pins on the machine itself have silver debris causing a short in the plate. You should clean the area under the build plate of all thermoplastic and silver debris to be sure. A last thing to check is that the temperature is actually set correctly in the Dashboard interface for the particular print job selected. NOTE: At this time there have been no reported cases of build plates malfunctioning out in the wild. It is usually an incorrectedly seated build plate that is missed on a quick exchange of the plate during or before printing.